It seems there are now two versions of the excellent PC hunting game theHunter (now re-named theHunter: Classic). There’s now a new version called theHunter: Call of the Wild, which appeared in the spring of 2017 for retailers. They appear to be identical, and it seems that theHunter: Call of the Wild just has a DVD box able to sit on a shelf in a mall and gets on Amazon at £18. According to a comment on Amazon theHunter: Call of the Wild apparently requires Steam, even though it ships on a DVD. And so far as I recall theHunter: Classic doesn’t require Steam but does need an Internet connection to prevent cheating. Other than that, I just can’t work out how they’re different. I had a look at the theHunter forums and there’s no FAQ or thread there on the matter. At £18, does the DVD version ship with all sorts of pay-for addons for free? Exclusive items and areas? I would presume so. But the gaming magazines obviously have no interest in the game beyond a few puzzled reviews and print-the-press-release items. So it’s all very mysterious. A decade after the most-excellent game Titan Quest, all of a sudden comes a large expansion Titan Quest: Ragnarok. It’s out now on Steam and switches the Mediterranean setting for the Northern… “realms of the Celts, the Northmen and the Asgardian gods”. Sounds good, very good. 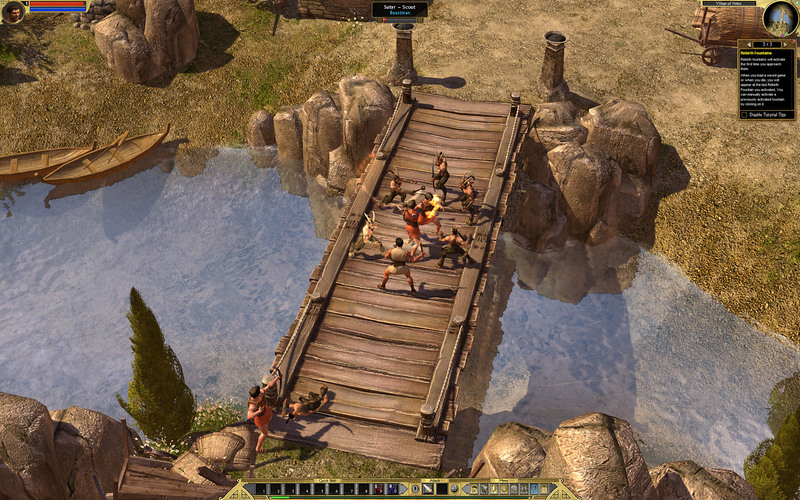 My review of Titan Quest Gold Edition is here. This has now been mildly superseded by the 10th anniversary edition. Sadly the review doesn’t mention that vital stat: how long it’s going to take a complete newbie to grind through the training levels, so they can get to the point where they step off the boat at Seyda Neen and not get nibbled to death by a small pack of Guars. Judging by my very limited past experience of MMOs (Ryzom, Lord of the Rings Online) all the potential joy of playing the game has evaporated by the time you’ve killed spider #276 or collected crystal #153 in your bid to level-up and thus actually get into the main game. The Nehrim guys have their huge Skyrim total-conversion out, and now have it pretty much nailed down. It’s called Enderal, is free, very well reviewed, and as pretty as you’d expect. Released last summer it’s now available in a full English version, which is currently patched to a 1.1.9 release — it’s now reported to be fairly stable. Which to me = it’s now playable. This Anniversary Edition combines Titan Quest + Titan Quest: Immortal Throne, but that’s not new — since the old Gold Edition did that. It allows Steam mods, but the original game shipped with a full Construction Set of the sort that allowed mods up to and including massive total conversions such as Lilith. It also rolls up and includes all the fan fixes to date, and removes GameSpy, both kind of useful. Apparently there are also stability fixes, but I found the Gold Edition game with the fan patch as solid as a rock anyway. * Scalable UI for larger screens. * Dozens of new heroes and bosses. * Improved enemy and pet AI. * Shader & renderer improvements. * Quick loot pick-up option. * Player run speed increased by 10%. * Higher stack limits inc. 25 health bottles, and a larger stash. That’s enough to tempt me back to the game, and I also see there’s a handy anti-creepy-crawly mod for the new edition: Turn all spiders into turtles or centaurs.